Introduction .. On this page, you will find all I have found out about what Essex Police Mobile first is all about, mixed in with my own thoughts, observations and of course resources. It will also help me educate the Public, the Police and myself on what one simple mobile phone or tablet is capable of. Visible policing to me, is not an officer walking or driving down a street, it's having a realtime conversation with officer's in your area, pooling information and keeping up to date with changes and alerts in your area. Wifi access and quad core mobiles mean it's easier than ever before. In my view, since late 2013 (and with especially with Android 5.0 Lollipop, Nov 2014), smartphones are capable of seamlessly blending what we as humans think in our heads, to what's possible with technology. And that's without linking in to Cloud Computing, Machine Learning, Neural Networks or Daydream VR. As a one model example, I use a Moto E 2nd Generation, you can buy for just £49. Using free wifi and free Apps, there really is no need to make SIM phone calls or texts and therefore that phone can actually make you real money. Try using Google Opinion Rewards where you get paid for answering questions. Currently, I have a balance of £4.75, handy to buy a cheap app or book. The biggest resource and most important link I can offer is support.google.com where you will see a list of 12 lead services, followed by 63 Consumer, 46 Business and 7 Developer Services (~128 in total). With over 90% of the people in the UK using Google to Search and Google Maps as a staple, all controlled by ONE Google login, it's pretty important stuff. Top of my list the the brilliant Bill Gates/Walter Chrysler quote, 'I choose a lazy person to do a hard job. Because a lazy person will find an easy way to do it'. I take that to mean there are no winners stuck in traffic, waiting on train platforms or delay in an airport lounge. The Internet, and that's why I love it, lets you zip across the planet in realtime. It lets you jump into people's public heads, get information, have some fun and stay informed and adjusted, able to cope with the ever changing world that surrounds us. For me that means Education in Public Safety, Community Support and Media Production. As a standalone independent teacher, it's very easy for me to think and write like this. Working from a home studio I have no commute. So devoting my 'commute time' to Public Safety, that allows me ten to fifteen hours a week. As it's a passion, I always do more. As someone who has and still is testing the odd piece of pre release software for google (as a trusted tester), it means it's been second nature for me, in the last five years, to look deeper and far beyond the shiny new feel to any device and it's most used features. As an Android and Chrome user, I recognise how powerful an Open Sourced and Free Platform 'breeds more innovation and more options for users and better business models for partners' . (as said by Sundar Pichai in the latest Alphabet Earnings Call, 27 Oct 16). Twitter .. The Essex Police Mobile First account, which was created on 1 Nov 2016, can be found at: twitter.com/epmobilefirst. It offers this bio text, 'Keeping @EssexPoliceUK officers mobile + visible'. It's worth noting, how Essex Police have increased their twitter accounts, from 104 at the start of 2015 to 204 (3pm 3 Nov 2016, see the list). You will also see how the list has 203 members, but not @EssexPoliceUK account. I have asked many times for the addition of the main account to this list, without success. Simple reason, for the public and officer to see ALL of what is happening on twitter in one list. EssexPoliceUK now have now passed 150,000 followers. From those 200+ accounts, many tweets have been made praising the new Samsung Galaxy Note 4 mobiles, usually with photos. One good example, from PC Graham Thomas, how he was training other officers (11 Sep, 5 Oct i, 5 Oct ii and 9 Oct). Of course there are many other tweets from many other officers, just need to find them. Two months ago, there was little or no information on what devices Essex Police were using and how they were doing it. Leading to the next section..
Essex Police themselves released some news on 26 Oct 16 called, Frontline officers go digital as force rolls out smartphones. There was also a video (embedded below). As some background, the Essex PCC office also published some information. I cannot find any news articles, but there are two documents 26 June 16 giving additional funding info and the 6 May 16 doc called Mobile Policing - Option 2 Device Purchase. Item 4.2 mentions 'the procurement of 4,000 Samsung Note 4 smart phones across both [Essex and Kent] forces. In addition, the PCC Roger Hirst invites feedback for the draft PCC 2016 (pdf version as Aug 16). In the 22 page document, look for: Priority 1c - give each officer a smartphone (page 6) and Effective Use of Technology, Deliver mobile policing to all frontline officers (page 21). Here's a collection of what the Essex Officers have tweeted about the new devices..
About the Samsung Galaxy Note 4 .. There is not much to say here, apart from the Note 4 was released globally from Oct 2014 (wiki). Do not be fooled by the fact it's two years old. The Note 4 is an incredibly powerful Quad Core machine and I have no hesitation is giving it the thumbs up for Essex Police. Samsung Knox .. If you look at many of the officer twitter photos, you'll see this a logo called Knox. Have a read of this page which outlines how, 'Samsung Knox provides security features that enable business and personal content to coexist on the same handset'. That said, and there are two sides to every coin, if you were organising Essex Police Mobile First right now, would you open or close the ability for personal and business to exist, yet partitioned, on the same handset? On the side of caution, you would probably opt for Business only. Afterall, social tweeting police officers will probably have another phone in their pocket, already loaded with twitter and the odd photo or video app. Keeping this stuff personal/business makes perfect sense, however the purest security coders will make a decision to trust Knox or not. In other words, if they trust the back end Samsung (and Google Servers), then their device should be considered safe and secure. Note: These notes are offered as my opinions, and nothing else - I am NOT a security expert. However, go checkout: myaccount.google.com/security as every android device will be logged in using a google account. And if you have NOT started using google two step authentication, they use it NOW. The News .. What have the News reported on Essex Police Mobile First? In my opinion very little, and when they have, it's a short hit and fade style article which is usually sourced from a press release and a quote. Two examples are the 'Phones to keep bobbies on beat' 15 Sep 16 (print scan image and online version) and the 'New phones will save police £4m' 6 Oct 16 (print scan image and echo-news online version). You will see in the last example how I've added some text and the article makes no math sense. It's not News that the News is written and researched to be 'newsworthy' and possible entertaining, unlike a piece of school homework (that will be thrown back at you by the teacher if it's below par). Here's one post dated 27 Oct 2016 from essex.live (the Essex Chronicle if we are still allowed to call it that) curiously called, 'How is Essex Police increasing the number of officers on the beat? where the post is totally features the 'smartphone launch', yet has no mention in the title. Odd. 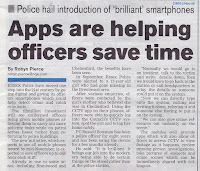 Contrast that with this from the East Anglican Daily Times called, 'Essex Police to spend £2m providing frontline officers with new smartphones featuring specialist apps to tackle crime' 26 Oct 2016 - see the difference, title alone says it all. And has three case studies in sub paragraphs, love it - top job reporter Andrew Hirst. edit 6.30pm Fri 4 Nov 16 - Hearing the letter box rattle with a paper copy of the CWN, I see the most curious article. 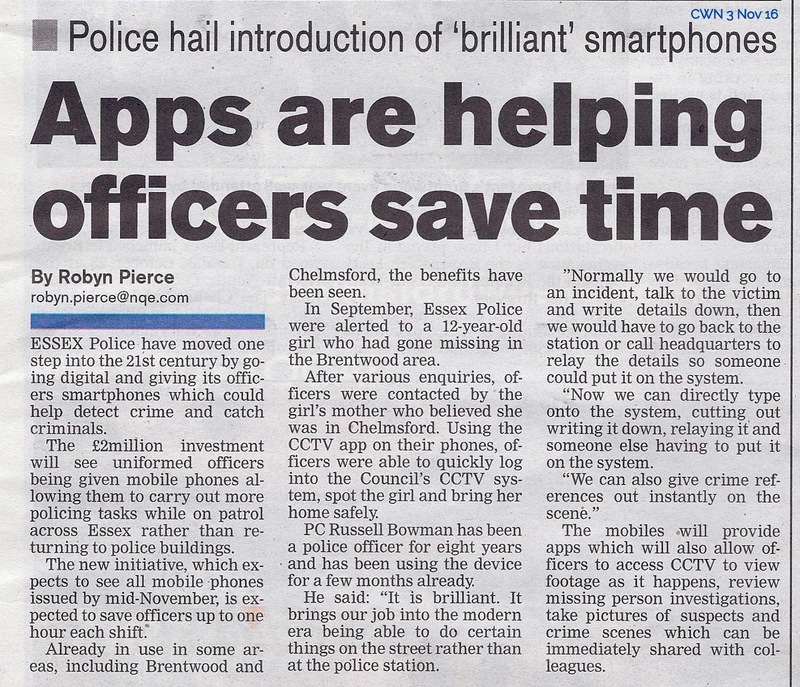 'Apps are helping officers save time'. I have no idea how the reporter arrived at this article, missing so much out. 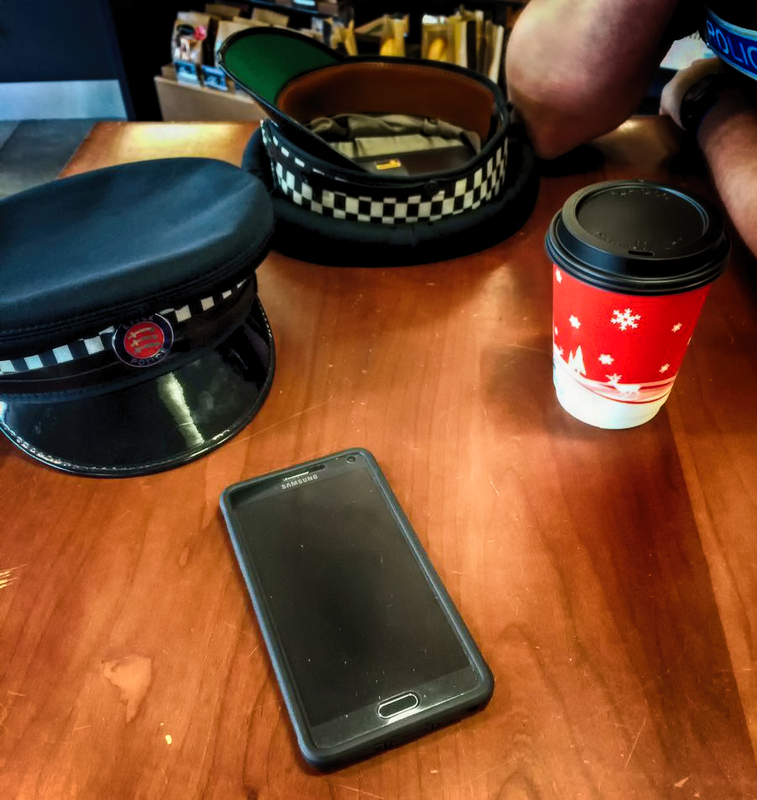 The online story is the same, just seven more paragraphs of text, a photo, and the headline, 'It's brilliant that we can stay out on the beat': All Essex police officers given smartphones to view CCTV and log crime reports' read article CWN. Again, odd. Footnote 1 - there is much more to add to this page as it happens and stuff that I have not mentioned like Project Athena. Footnote 2 - Thanks to PC Josh Haase for his tweet and photo, just what I needed for a lead image for this post.